Since 22 August 2013 all foreigners can get Belarusian visas through the Minsk National Airport just after their arrival. However, these and other relaxations in the visa regime on the eve of the 2014 Ice Hockey World Cup still remain incomplete. They leave a number of obstacles on the path to simplifying travel to Belarus and from Belarus which includes low number of no visa treaties with other countries and high visa costs. Moreover, the government does not want to address the painful issue of the simplification of the visa regime with the EU for purely political reasons. Visa liberalisation will lead to potentially unpleasant consequences for Belarusian authorities such as brain drain and the impossibility to prohibit undesirable Western politicians and activists from entering Belarus. How to Get a Belarusian Visa? Naturally, to enter Belarus nearly all of those coming from countries outside of the former Soviet Union must obtain visas. Belarusian legislation provides for three types of entry visas: B — transit visa; C — short-term visa, valid for up to 90 days and D — long-term visa, valid for up to one year with the right to stay up to 90 days. Entry visas may be single-entry, double-entry and multiple-entry. One can get any of these visas either at a Belarusian embassy (consulate) or in the Minsk National Airport. The law requires foreigners to submit a number of documents such as completed visa application form, a foreign travel document, and other support documents (depending on the purpose of the visit – invitations, confirmation letters, etc). The process of granting visas normally takes five days (two days for urgent applications for an additional fee). When denying the application a consular officer does not have to explain the reasons. 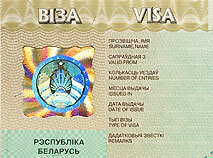 Beginning 22 August 2013 all foreigners can also obtain visas in the Minsk National Airport in accordance with a newly adopted regulation of the Council of Ministers. However, this relaxation of the visa regime has failed to release foreign visitors from all bureaucratic obstacles. Visa support documents must be submitted to the Foreign Admissions Division (FAD) of the Consular Directorate of the Ministry of Foreign Affairs in advance: for short-term visas – no later than 3 business days before the expected date of arrival (5 days – for long-term visas). Belarus has concluded a limited number of treaties establishing no visa regime. For now Belarusians can travel freely to 22 countries, a figure which appears to be a relatively low figure in comparison with its neighbouring states. In addition, Belarusian authorities have recently announced that they will allow all foreigners to stay in the country during the Ice Hockey World Championship in May 2014 without visas, given they have bought one ticket to any hockey game of the tournament. By relaxing the visa requirements at the airport and during the upcoming Ice Hockey Cup, the Belarusian government is taking steps in the right direction. For Moldova, Ukraine and Russia, for example, foreigners do not have the possibility of obtaining visas at the airport, only in consulates and embassies. However, moving towards less bureaucracy should be accompanied by cancelling visa regimes with other new states. The cost of entry visas in Belarus varies much depends not only on their term but also on the citizenship of the applicant. The latest rise in prices occurred in 2010 when visa costs increased by 50% to 200% depending on the place of issuance (airport or embassy). The official web site of the Belarusian Ministry for Foreign Affairs explains that the difference in the visa costs by the "reciprocity principle". In other words, Belarus applies the same tariffs to foreigners as those countries apply to Belarusian citizens. If the authorities were to become serious about attracting foreign travellers, businessmen or students they would lower the visa prices. The actual figures indicate that the Belarusian government has chosen not to go this route. The strict EU-Belarus visa regime, however, remains one of the most crucial problems for Belarusian civil society, business and youth with regards to visa affairs. In 2012 Belarus became a world leader in the number of Schengen visas issued per capita (74 visas per 1,000 citizens). Most of those visas are short term and single-entry. Belarusians have to pay €60 ($79) for these visas (the highest price in Europe), while Moldovans, Ukrainians and Russians pay only €35 ($46). Calls for visa regime relaxation filled numerous memos sent by Belarusian civil society groups to European institutions. The civil coalition ”Visa Free Travel Campaign: Go Europe! Go Belarus!”, established in 2011, became one of the most remarkable initiatives of its kind. They regularly launch various activities from essay contests to making movies and photo albums, all of them related to campaigning for a visa free regime. The Council of the EU has inserted a visa liberalisation clause in a number of its documents on Belarus during the last years. Yet, no visible progress has been achieved. A part of the problem is that the EU Visa Code is binding for all the Schengen member-states — countries cannot unilaterally address the visa issue: any progress must be based upon the reciprocity principle. On the other hand, the Belarusian government links this issue to EU sanctions, which cannot be lifted without advances in human rights in Belarus. Though not admitting to it, the Belarusian regime has some other problems with a possible visa free regime (or its relaxation) with the European Union. Independent polls show that a huge number of Belarusians want to leave the country for various reasons. The Belarusian Institute for Strategic Studies (BISS) gives a figure of 28% for those who wish to emigrate and the Independent Institute of Socio-Economic and Political Studies (IISEPS) has the number at 41.4% (53.7% – for temporary migration). Relaxation of the visa regime with the EU will surely foster this process. Bearing in mind that about 350,000 Belarusian citizens already work abroad, as the BISS survey has shown, the government will unlikely be interested in stimulating further migration. Secondly, more Belarusians travelling to the West means more democratic sentiments and ideas, poisonous for the autocracy -- ideas that could penetrate Belarusian society. Moreover, maintaining a visa regime with the EU enables Belarusian authorities to prevent undesirable western politicians and civil activists from visiting the country by simply rejecting their visa applications. In September 2012 this happened with European MPs Emanuelis Zingeris and Marieluise Beck. Thus, the Belarusian government may take some measures to simplify its visa regime, especially for the sake of the image of events like the Ice Hockey Championship. But the authorities will hardly venture to remove their last protective barrier from the EU because they place their political interests above the needs of Belarusian society.